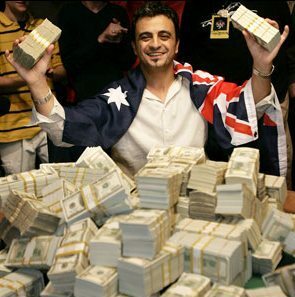 Joseph Hachem (born 11 March 1966) is a Lebanese-Australian professional poker player known for winning the main event of the 2005 World Series of Poker. He was the first Australian to win the main event, which earned him $7.5 million, then a record for all-time biggest tournament prize. The next year, Hachem won his first World Poker Tour title at the Bellagio Casino's Five Diamonds Poker Classic, earning him $2.2 million. He is one of only five poker players to win both a World Series of Poker main event and a World Poker Tour championship. Including WSOP main event victory, Hachem has finished in the money in 10 World Series events. At the 2006 World Series of Poker, Hachem finished second in the $2,500 short-handed no limit hold 'em event, which drew 1,068 players. During the final hand, Hachem went all in with A♠ Q♣ and was called by Dutch Boyd, who had A♦ 5♥. Although a favorite after the flop of A♥ K♣ 9♠, Hachem lost when Boyd caught a five of diamonds on the river. Hachem won $256,800 from the second place finish, but was nevertheless visibly disappointed by the outcome, and was comforted by his wife Jeanine and friend Greg Raymer, the 2004 World Series of Poker champion. Also in the 2006 World Series, Hachem finished fourth in the $2,500 pot limit hold'em tournament, which had a starting field of 562 players. In the final table, Hachem eliminated Lee Grove with a pair of kings and Alex Jacob with three queens. But Hachem was eliminated after once again taking a bad beat on the river. He moved all in against John Gale with K♦ 9♥ on a K♠ 8♥ 4♣ 3♣, against Gale's A♣ 3♦. Gale eliminated Hachem after catching an ace of spades on the river. Hachem earned $90,482 for the fourth place finish, and Gale eventually won the tournament. Hachem finished in 238th place at the 2006 World Series main event, earning him $42,882. In defense of his 2005 title, Hachem outlasted about 97% of the record field of more than 8,000 players in the tournament. Hachem was eliminated after his pocket Aces were outdrawn by Andrew Schreibman's pocket Jacks. He was the last remaining Main Event champion left in the field, as Greg Raymer had been the year before. In December 2006, Hachem won $2,207,575 and his first World Poker Tour title at the Bellagio Casino's Five Diamonds Poker Classic. The victory made Hachem one of only five poker players to win both a World Series of Poker main event and a World Poker Tour championship, along with Doyle Brunson, Carlos Mortensen, Scotty Nguyen and Dan Harrington. Hachem won the "World Series of Poker Champions II" tournament on NBC's Poker After Dark on a table consisting of Main Event winners Doyle Brunson, Greg Raymer, Jamie Gold, Huck Seed and Johnny Chan, whom he defeated heads up to win $120,000. 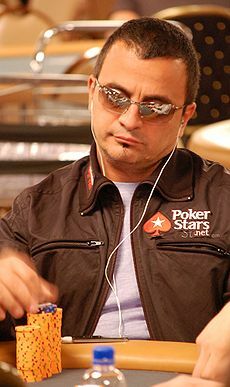 In 2006, Hachem appeared in Poker Superstars III, but failed to advance to the Super 16 round by only one point. In December 2007, Hachem won the Poker Stars Asia Pacific Poker Tour Tournament of Champions, which included a field of such players as Raymer, Chris Moneymaker and Isabelle Mercier. In April 2008, Hachem came close to the final table of the PokerStars EPT Monte Carlo Grand Final, finish in 11th place for more than $150,000. Hachem finished in 103rd place in the 2009 World Series of Poker main event, which drew a crowd of 6,494 players earning himself $40,288. Also in 2009, Hachem participated in the fifth season of High Stakes Poker, a cash game television series on the Game Show Network. The season featured a buy-in of at least $200,000, the highest minimum requirement in the show's history. Also in 2009, Hachem produced and hosted the Australian reality show The Poker Star, which characterizes Hachem as a poker mentor searching for the next big player. The show features a group of contestants living together in one house and competing in a series of poker-related challenges. As of 1 October 2009, Hachem's total live tournament winnings exceed $10,850,000, more than $7.9 million of which comes from the World Series of Poker events. He is ranked fifth in live poker tournament career earnings by The Hendon Mob, a website which tracks tournament poker players.